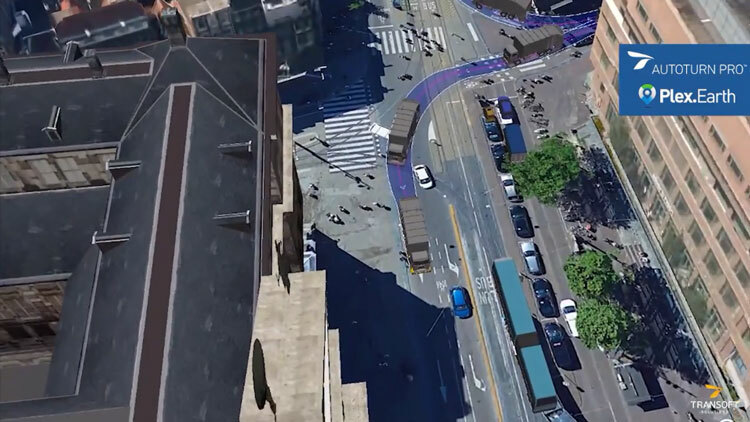 Transoft Solutions Inc., a global provider of transportation engineering design and analysis software, has partnered with Plexscape, developers of Plex.Earth, a popular tool for AutoCAD. Central to the partnership was integrating AutoTURN technology with Plex.Earth to allow engineers and designers to demonstrate vehicle swept path analyses directly into Google Earth enabling them to create and share engaging presentations and reduce revisions and overall cost. “Civil engineering is about making the world a better place and here at Plexscape we are committed to help engineers by always giving them the most accurate real-world view of their project sites”, said Mr. Lambros Kaliakatsos, Founder & CEO of Plexscape. “For 9 years now, Plex.Earth, our flagship solution, enables them to have instant access to high-quality satellite imagery and terrain morphology data. We strongly believe that our partnership with Transoft Solutions, a company that has changed the way the future of transportation is being designed, will help AEC professionals make design decisions with more confidence and keep their projects on time and on budget”.